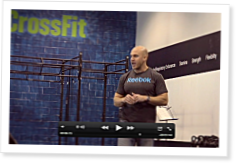 Original Firebreather Greg Amundson sits down with the camera at Reebok CrossFit One to share what it was like to be an original student of CrossFit founder Greg Glassman and what his experiences have taught him about leadership. Having tackled the mind-body connection in Part 1, Amundson describes the importance of that connection under conditions of mental fatigue. “What we have to do is get our body in line with our mind when we find that our mind is wandering,” he says. According to Amundson, assuming a powerful position with your posture can boost your mental stamina. I have always liked hearing from Tommy on these video's, just comes off as a stand up guy. Most all of the athletes do, but for some reason he stands out though. Greg Amundson needs to write a book. I would be first in line to order it. Greg, you are the man! Easily one of the most inspiring and passionate speakers ever! I can't wait to share this information with my Athletes. Hackenbruck climbed up a hill with 110 lbs on his back and didn't say a thing? Heroic. Once again, it was a pleasure and a privilege to be present for this talk. Greg is a great speaker, and his passion for his topic is spellbinding. For me, it was also the right words at the right time. Helped me immensely! Thanks Greg! Everytime i listen to Greg speak i feel like running to my box and hammering out a WOD. 100% inspiration. More amazing words from CrossFit's original firebreather. Thank you for what you do for our community Greg, what an inspiration. The CrossFit community is very fortunate to have Greg A.
Greg A. is the man. and what being a crossfitter and human being is all about. Awe-inspiring stuff Greg. You should be a world leader! The guy yawning in the front row was the best bit! Great series, I hope there is more. I like Greg sitting on the bench with wallball target mickey mouse ears! TOUGH call, but, this may be my favorite GA video yet! This dude is straight up THE man, his commitment to life and excellence is full throttle and I don't know what else to say but Greg is the type of man who can lead an army! Again, a beautiful and inspirational talk. Keep it up. You are a natural leader and an enlightening person. Our community is better because of you. Great Video. Really God Stuff for any leader not just a CrossFit leader. Very applicable for a ball coach or any leader of men. "The two qualities of a leader: goal setting and positive self-talk"
The idea that leadership is in all of us and all we have to do is take the crap out that hinders us is the best way I've ever heard it said. Thanks brother. Make's me want to be in the military again so I could join OCS in the Army and hang out with you all day. i love these videos. I train a group of high school kids and my favorite saying to them when they say they can't do something is, "it would be a lot easier if you took off your twenty pound weight vest of negativity". Keep these videos coming. Every reminder that positive self talk is crucial to life and to training is more than welcome. Excellent job sir. I've been a student of leadership for a long time, and this series is in the top five of everything I've heard or read. Keep up the good work. Thanks, Greg. Can you come out to Brooklyn and give a talk out here? What I find most impressive about Greg's talks is not the content so much -- it's good, but simple, and it's all been covered before -- but the way in which he delivers it. Greg's passion and sincerity are abundantly clear, and that's the kind of thing that really inspires. When I watch videos of Greg, I think of the John Wesley quote, "Catch on fire with enthusiasm and people will come for miles to watch you burn."